3/11/2011 - Today I'm announcing a new twist on CCDD. Today (and hopefully every friday) I will feature a design that is not my own. Why? I can't be the only one that's getting a little tired of my voice. Seriously though, a big part of being a designer is the ability to understand other people's designs; to find flaws and improve upon them; but more importantly, to discover the seeds of brilliance in them. More on this after the card. 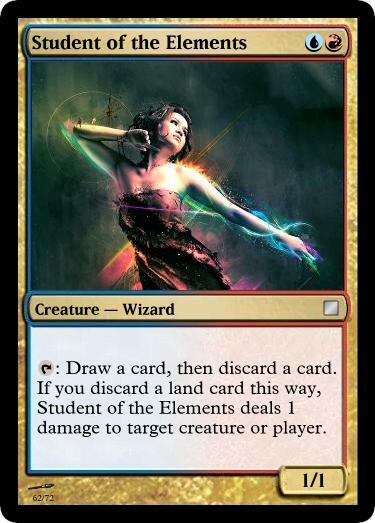 I found today's CCDD in the forums at magicseteditor.com which—apart from hosting the best developed Magic software ever (just edging out DotP thanks to its limitless breadth of scope)—also features some of the custom card designs of its users. 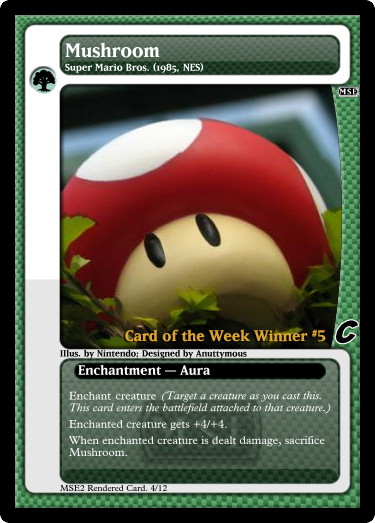 Mushroom won Card of the Week #5 and was designed by Anuttymous. Yes, that's one funky card frame, but it's in the spirit of the reference, which you can't not love. Looking past the Nintendoism, Mushroom is actually a very clever card. The power-up idea is very resonant. Get a power-up, become bigger/stronger/faster; when you get hit, lose the power-up instead of dying. It's classic and this card hits that note very well. The gameplay is interesting too: It's a Giant Growth that sticks to your creature until your opponent knocks it off. Nice work, Anuttymous. I offer two minor suggestions that I think could make the card even more perfect. The first helps the card nail its thematic mark even harder. As the card is currently written, the enchanted creature will lose its toughness bonus as soon as it's damaged, which means that the +4 toughness is entirely irrelevant and the creature will die to anything that would have killed it before it was enchanted. I want this power-up to absorb the first hit like it would in a Mario game, so I suggest changing the last line to "If enchanted creature would be dealt damage, instead sacrifice Mushroom" which is a (perhaps too) clever way of saying, "prevent the next chunk of damage dealt to Mario." Another alternative is to set up a delayed trigger that won't sacrifice the aura until the end of the turn in which the creature was dealt damage. That makes the toughness bonus more relevant but is less clean mechanically and implies a delay that was never present in the video games. The second minor tweak I would suggest is to reduce the bonus to +3/+3. Now that the card takes a hit for the creature, it's often better than Giant Growth even at sorcery speed. Regardless of power reasons, the +3/+3 just feels more natural thanks to Giant Growth's precedence. Considering the fact that Mushroom could deal a defenseless opponent +3 damage per turn, it's probably reasonable to cost it at 1G or even 2G (though we'd likely restore the larger p/t bonus at that point). I hesitate to call this a contest since the rules are nebulous, the judging spurious and the prizes minimal, but that's what it is in spirit and it's just easier than "maybe-weekly-event-in-which-I-select-a-user-submitted-design-and-send-that-user-stuff." None of this is remotely legally binding and you grant all rights, blah blah blah... I'm a cool dude, you're a cool dude or dudette: whatever. I'm inviting you to submit to me a maximum of one card design this week (plain text is fine). I will choose one of these submissions, feature it here next Friday and give you credit. I intend to discuss what's good and bad about the card and I may or may not offer tweaks or suggest a lesson to learn from how well- or poorly-crafted it is. 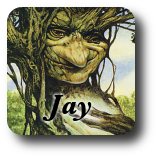 The reward for being selected is that I will mail you a physical playset of your card, prototyped out. It may take a while and it won't be the premium packaging you'd expect from an online purchase, but I'll do my best. I intend for this to be a weekly occurrence, but we'll just see how the first one goes and take it from there. You can tweet me your submission @WizardsFamiliar or comment here. If I select yours and you want the physical prize, you'll need to DM or email me your address. Actually, the toughness bonus would count for -1/-1 effects and counters, so it's not entirely useless. None the less, the sacrifice to prevent damage caveat is better. It is a nice, evocative card though. I think it would carry the Mario reference further if it said "double enchanted creature's power and toughness." So, funny story: The wise and blunt Jon Becker pointed out that, with my change, this is really similar to Boar Umbra. Hard to argue with that.